Are you planning a kids Halloween party this October? Planning a party doesn’t have to be stressful. 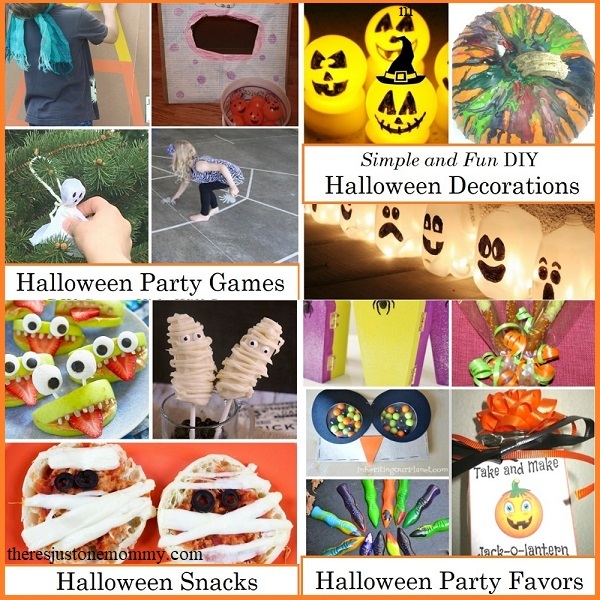 From DIY Halloween decorations to fun Halloween party games, I’ve scoured the Internet to find all the BEST kids Halloween party ideas and put them in one spot so you can rock that party like a pro. You can’t have a party with out decorations. Here are some fun and easy DIY Halloween decorations you and the kids can make to help set the party mood. The kids will be proud to make their own Paper Plate Pumpkin decorations. I love these simple and cute Candy Corn Trees! Take those tomato cages from the garden and make your own Tomato Cage Ghosts. Or, use a balloon for these Garden Ghouls! Get the kids involved and make this over-sized Eyeball Garland before the party. These over-sized stick spider webs are a fun Halloween craft and can be used as party decorations. Recycle those milk jugs into your own Milk Jug Ghosts! Let the kids get creative and make these Paper Plate Monsters as decorations. Use those old crayons to create colorful crayon drip pumpkins — perfect table centerpiece. These glowing Halloween decorations would be a fun party craft kids can take home. And don’t forget to create some Broomstick Parking! Fill those bellies with more than just candy. Once the guests arrive, they’ll enjoy these tasty Halloween snacks. Caramel apples are always a hit, make ’em extra special by creating your own Caramel Apple Monsters. Kids love hotdogs, and these Hairy Hotdogs are sure to please! When it comes to party food, you just can’t lose with this Halloween Chex Mix. These Apple Monsters are cute and healthy. Pizza is always popular with kids. Check out these mini Mummy Pizzas. I love these simple Rice Krispy treat ghosts! Not all treats have to be sweet. I love these simple String Cheese Mummies. Little ones can’t handle a whole apple? How about these yummy Caramel Apple Pops? These Chocolate Covered Banana Mummies are almost too cute to eat! Talk about cute, check out these Orange Jack-O-Lantern Fruit Cups! Why save the carving for just pumpkins? Create some Spooky Fruit centerpieces that double as cute snacks! Wash down all those delicious snacks with some healthy Ghost Milk! Or, make these cute Drink Box Mummies! Don’t let the kids get bored! 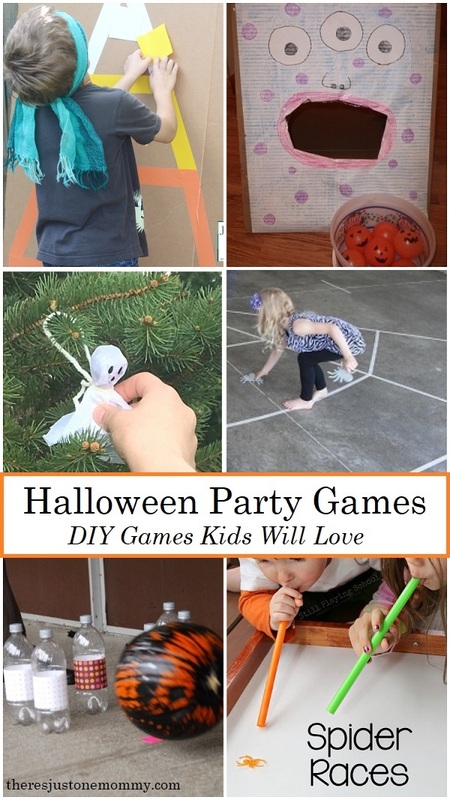 Keep them happy with some of these fun DIY Halloween games. Grab a box and create this easy Feed the Monster game! Print out these Halloween Charades ideas for some classic party fun. Put a Halloween spin on an old favorite with this Pin the Face on the Monster Halloween party game! Get the kids moving with some fun Pumpkin Bowling. Have a bang with this Pop the Pumpkin game! Fill up your pumpkin in a fun Popcorn Race! Take the kids on their very own Lollipop Ghost Hunt. Create your very own Tape Spider Web Maze. Or, make your web 3-D with this Spider Web Maze. Need one more web idea? How about a Sticky Spider Web? I love this Spider Race idea, using plastic spider rings. Have younger kids attending? Try this fun Halloween Play Dough idea. Recycle some tin cans and play a howling fun game of Tin Can Bowling. Younger kids will have fun with this Candy Corn Color Match Halloween game. 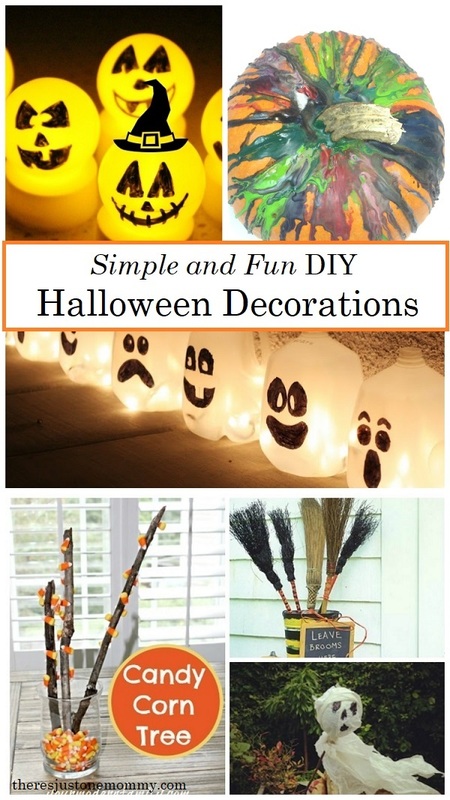 Or maybe you just want a few Halloween Crafts to keep them busy! 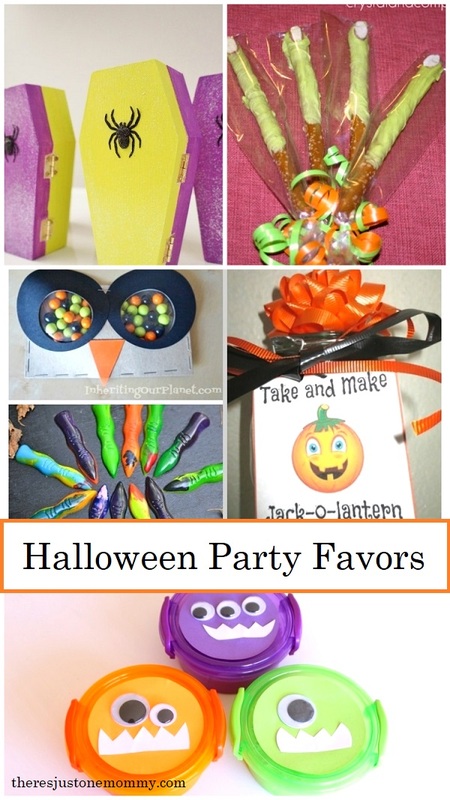 When the festivities are over, send them off with one of these cute Halloween party favors. These See-Through Owl Party Favors are adorable! Send each child home with their very own Take and Make Jack-O-Lantern. These Witchy Fingers would be a cute take home treat. Kids will love these take home Monster Slime Halloween party favors. These Witch Finger Crayons are sure to be a hit with artists of all ages. I love these Glittery Coffin Boxes as a fun DIY Halloween party favor. I hope you have a spooktacular time this October with all of your festivities. From DIY decorations and tasty treats, to the party favors and everything in between, these Halloween party ideas are sure to make your party a hit. Updated post. Post originally published September 18, 2014. We love Halloween and these ideas look so fun! Such a cute play dough idea — perfect for any younger party-goers! Thanks for stopping by! 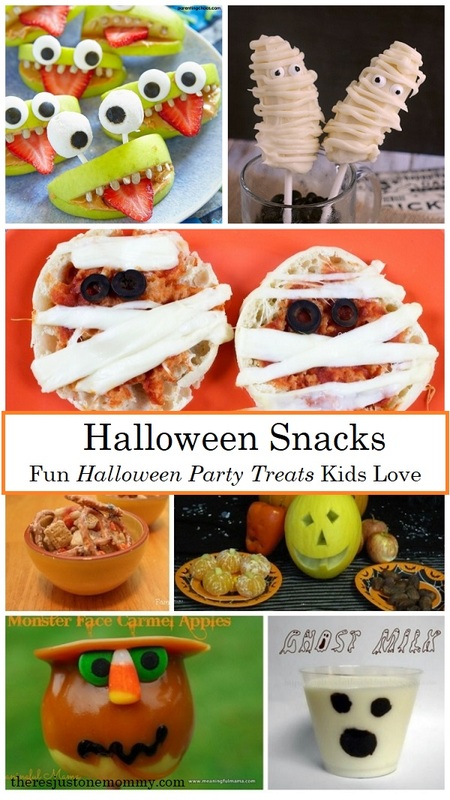 These children’s Halloween party ideas are so much fun. It makes me want to throw a Halloween party! I really like the witch finger crayons. They will make a great non-food treat for my boys’ preschool parties! This is such a great list. A great resource for those having Halloween parties and even just wanting to make the season festive! Thank you for sharing on #made4kids. I hope you come share with us this Sunday night too!! Definitely some fun ideas to do with the family this season!